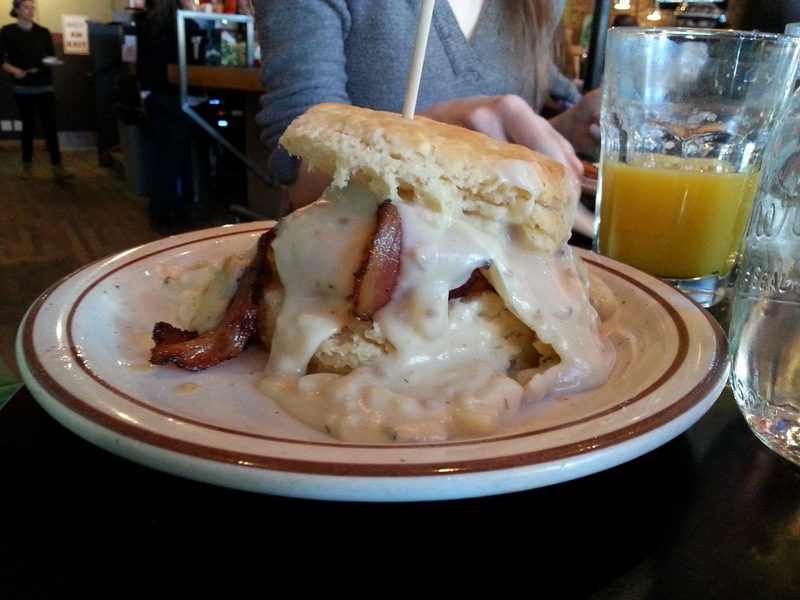 When we make it back to Denver we will stop at nothing to make a trip to the Denver Biscuit Company. Just look at these photos and tell me you are not drooling already! 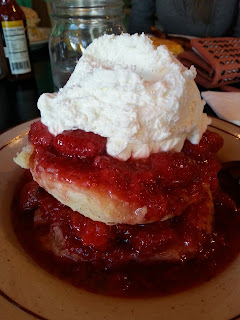 I would advise that even this sweet tooth had to sneak some bites of my husbands savory ham biscuit as the Strawberry Shortcake is quite a treat! I love food and I'm pretty hard to disappoint but when I tell you that you will LOVE The Hearthstone Bistro, I'm serious. Aside from the beautiful west Michigan beaches, this place is the best thing Muskegon Michigan has to offer. 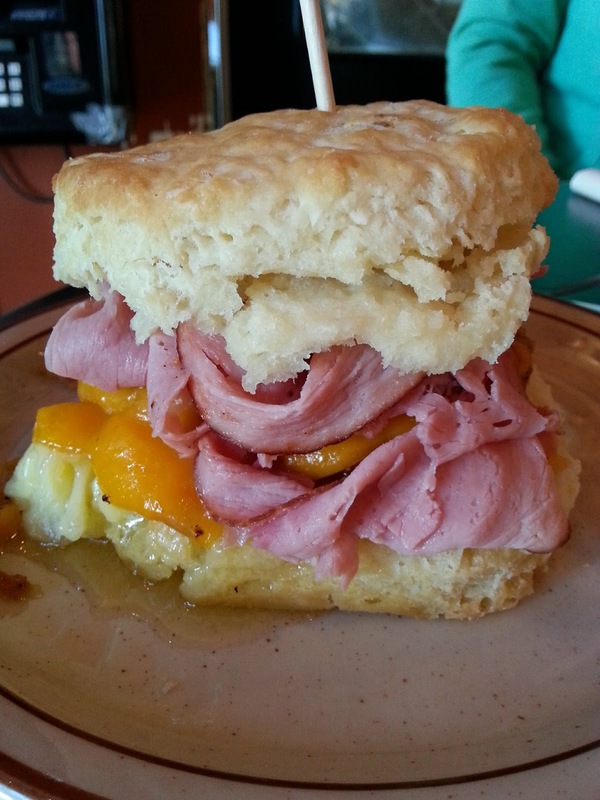 Hearthstone has been around since 1975 and uses fresh local ingredients. Their menu offers soups, sandwiches, beef or poultry dishes, pasta, burgers and salads. As simple as it may be, my favorite menu item is their soup and sandwich combo. The daily soups are always unique and exquisite. Hands down, they offer the most delicious soups you will ever taste. Just in the past month they have offered Pumpkin Curry, Roasted Parsnip and Carrot, Roasted Tomato & Apricot Bisque and Asparagus Leek Bisque with Lemon Basil Goat Cheese Garnish. Their most popular soups are always available and include Wisconsin Cheddar with Popcorn and French Onion Gratinèe. 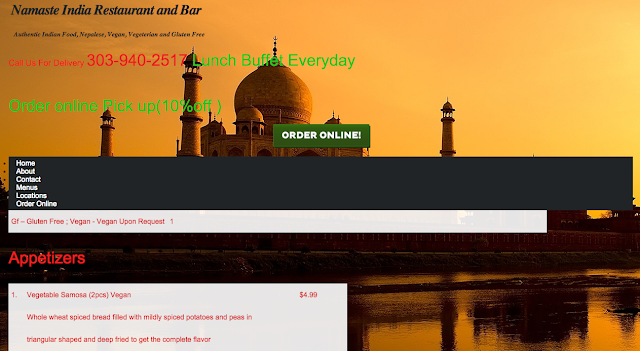 We've ordered their specials on several occasions and never been disappointed. Actually, of the dozens of dishes we've enjoyed we've loved and savored ever single bite. Hearthstone will not let you down! While the atmosphere is beautiful and nice enough to enjoy a nice date or business meeting it's also inviting, casual and welcoming to families. Their prices are outstanding! For the same price as a foot long at Subway you can enjoy a soup and sandwich combo created by a real chef with local and fresh ingredients. If you find yourself in west Michigan I highly encourage you to make a special trip to enjoy a meal here! First off, we must state our prejudice, that of, we go out to eat with the intention of going OUT. So, Bite Squad had a large plate to fill in order for us to approve. This frustrated us, so we aggressively hit the red X to CLOSE the matter. But our fortitude is strong and we would not be deterred so easily. Thus we got back on the next day and to our dismay the exact SAME thing happened when we typed in the SAME address! So we went in search of a Map to find the way to the closest restaurant. For if we can’t get delivery, then we’ll just have to deliver ourselves. But to their credit they are a DELIVERY SERVICE. So why do you need a map if they are coming to you … You don’t. It just happens that my case is outside their map. 9 results! Now We’ve gotten somewhere! 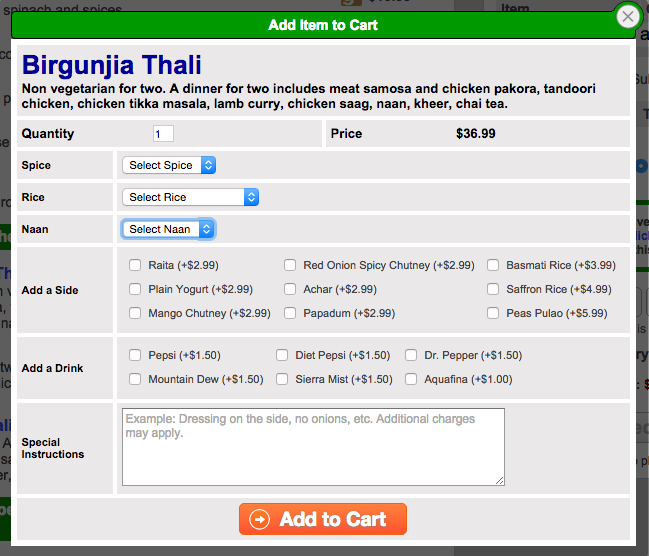 We looked over the options and decided that Indian Food might just be the hardest option for Bite Squad’s system. We clicked on the restaurant and we were instantly looking at an excellent user friendly menu. I was impressed by the collapsing and expanding menu sections, description of food, and OBVIOUS Price which all made for an easy read and check out. Once a menu choice has been made the pop up options further the ease of ordering with Bite Squad. Just look at it! It’s more options than the waiters give you and you don’t even have to try and memorize the spew of options that they rattle off their tongue. We made our selection, added in a few special comments, (we of course had to test if it would be passed along to the cooks), and just as a final test we scheduled the pick up for a day and a half later! Let's see if they deliver (that is figuratively of course because they don’t actually deliver food to my house)! Every thing is in order and as requested. Besides the sad fact that I live outside of their delivery circle and the error which that causes on the website, Bite Squad is an exceptionally convenient menu and ordering system for those who can not or wish not to eat OUT. My favorite summer evening was spent sitting and enjoying this miraculous view at sunset while savoring the most delicious food Muskegon has to offer. 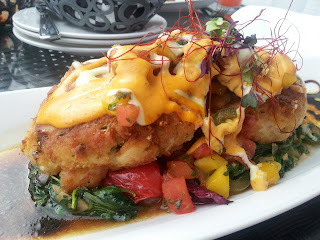 The Lake House Waterfont Grille is probably my #1 favorite restaurant in Michigan so far. The wait staff is exceptional. They even offer blankets if you get cold. 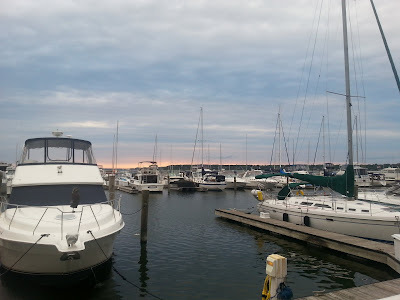 The environment is nice enough to go on a special anniversary date or hold a nice business meeting yet the outside deck is causal enough to make families with children feel welcome. We had my mom in town from the West Coast. She insisted we try truffle fries since we'd never had them. These were mind blowing. 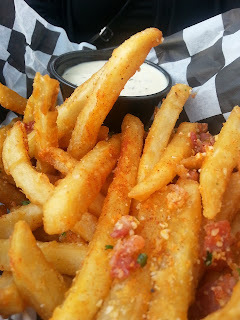 Bacon, malt vinegar/tarragon aioli , Parmesan... fries have never been so decadent. Their crab cakes were made to perfection. Not only do they taste incredible but look at them! They are beautiful! 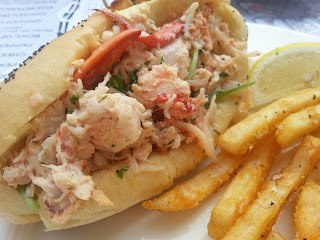 I had the lobster roll. Not only was this the most delicious thing I've eaten in a long time but the quality was exceptional. The chunks of lobster were huge! The amount they stuff into a sandwich is impressive. 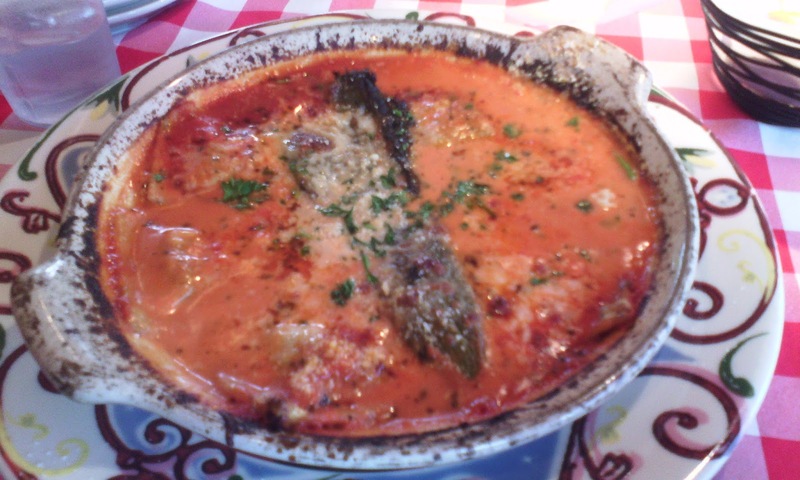 This dish right here, is the reason I'll be back sooner than later. I took a look at the menu as I wrote this. It looks like these are summer items that are not on the menu now that it's fall. I did notice they have a pumpkin ravioli though. I might have to stop in and give that a try. Imagine... you are 5 hours into a 9 hour drive. The kids are cranky. The wife is cranky. 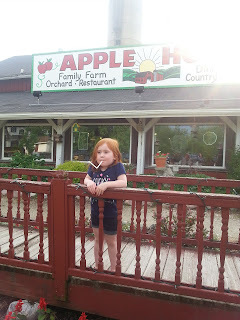 The husband, being the hero that he is, sees a sign for a farm and restaurant. Without mentioning it he pulls off and parks. 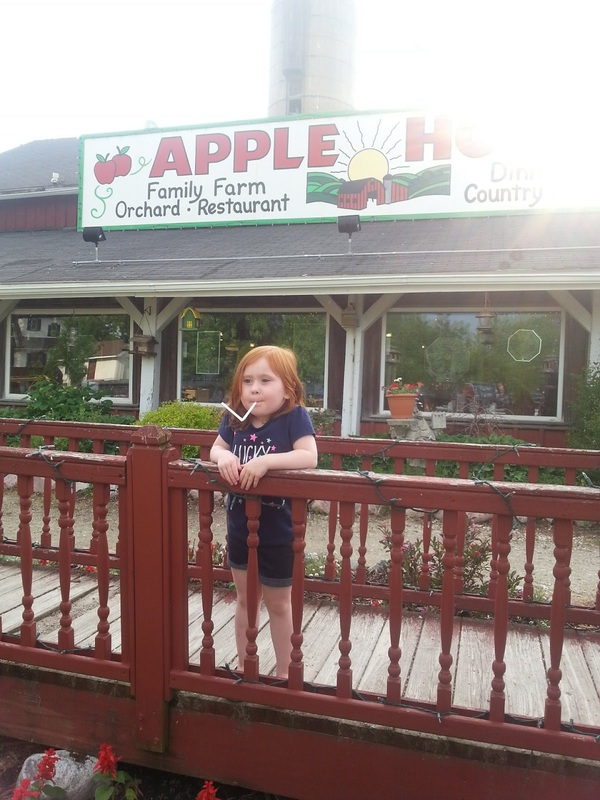 That is exactly how we landed at Apple Holler. He claims we were hangry. I believe him, that's a real thing in this household. We walk into this cute little place. I feel like I've time hopped back into the 90's and landed in hillbilly Timbuktu. When you first walk in you see a cute country store with baked goods, jams, pies and souvenirs. The waiters are dressed in overalls. Everything is dark and every surface is made of wood. Our young waiter is overly happy and seems helpful. We ask him what's good. 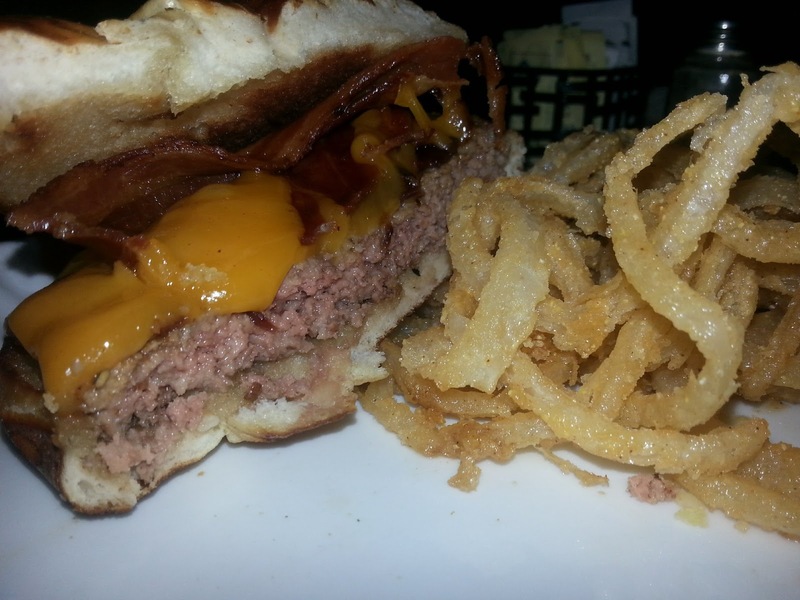 He tells us their burger that's stuffed with apples and topped with cheese is great so we order that with a side of onion strings. 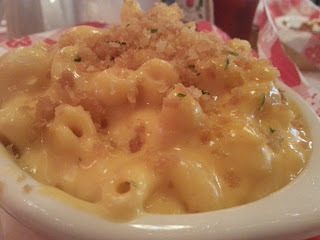 We ordered our little girls home made macaroni and cheese. We wanted to try a pie so we decided one burger and ask that the pie comes out at the same time. The waiter comes back with water and gives us 2 straws for the 4 of us. Next he brings our food. He forgets the pie. We eat our food. The burger was good but there is absolutely no sign of apple anywhere. Either they gave us the wrong burger or their apple stuffed burger has one microscopic apple piece in it. Not sure. It was also under cooked. But! The cheese was good and so were the onions. The girls loved their noodles. We wait and wait, as we still have 4 hours left on the road with tired kids. We keep waiting. We all take potty breaks. Finally! The waiter comes back and tells us he'll bring our pie. Great... not really the time now buddy. What feels like 10 minutes longer he comes and tells us they don't have any more apple pie and asks if this other flavor (cheery?) will do. We declined. We wanted it with our dinner and by then it was time to get back on the road. The front is so cute we did take time to take some photos. The farm would have been fun but it was closed. Overall, I'd not hesitate to check this place out if I were you. I'd just be sure you know it's not a stop into an average diner. You'll be here a while but it's kind of fun. I hate to be mean. I dislike writing negative reviews. I wish I could just write positive reviews but, that's not what critiquing is about. 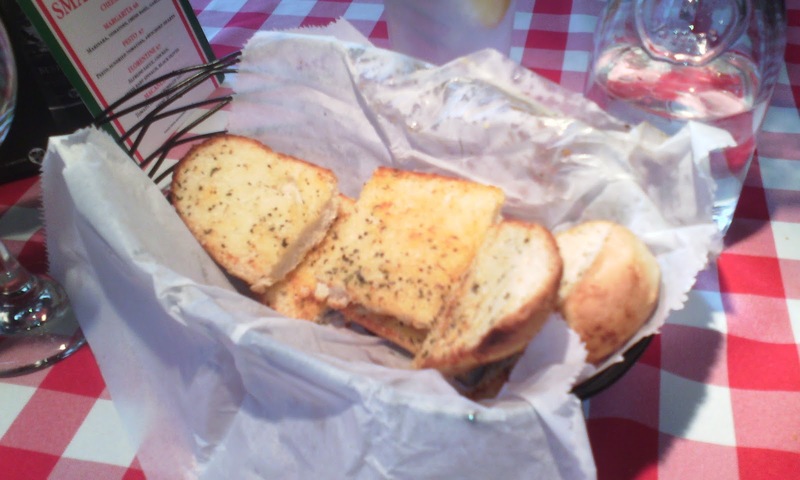 When we moved to Western Michigan, we had a few people tell us to try Fricano's. I love pizza and Fricano's is on the lake so I thought this would be a special night out. I don't think I can even begin to express how disappointed I was with our Fricano's experience. To put it nicely, no joke, Totino's Party Pizza is better than a Fricano's pizza. First of all, our waitress greets us by asking "What will you have?". We looked at her confused. 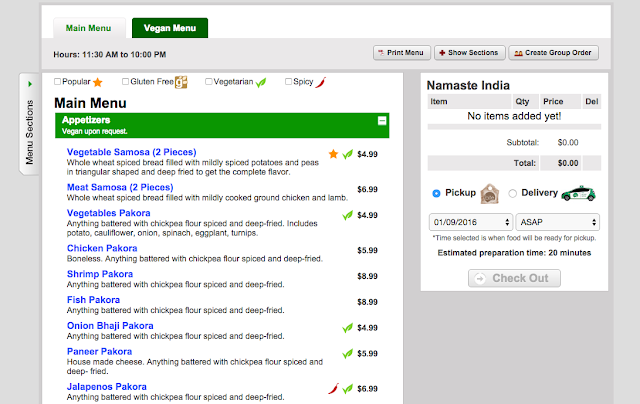 We explain that we have no way of knowing what they serve as we received no menus. She explains that they only have 5 toppings and one size pizza so they have no menu. At this point we don't know how much or how big a pizza is. How much would it cost to have this information printed onto a little place card to set on the tables? So Fricano's only offers 5 toppings. You can choose from sausage, peperoni, anchovies, green peppers or mushrooms. I love all of the above toppings but I don't quite understand why they don't offer a larger variety. We tried a sausage and mushroom pizza and a peperoni pizza. The peperoni here is fine. It seems like a good quality pepperoni. The sausage too seemed to be pretty decent. I was really shocked and grossed out by the canned mushrooms though. Maybe it's a Michigan thing but I don't find canned mushrooms to be appetizing at all. I wish they'd use fresh. I especially didn't like the crust. It may just be a tortilla. I don't know but it's hardly pizza. I am so sorry Fricano's and Fricano's lovers. Oh, the one positive... the view is wonderful! With the revolution of pizza transforming to fast casual dinning PizzaRev is a great addition to the pie. As the first PizzaRev opens it's doors in Boulder, Colorado we had the privilege of experiencing its revolutionary speed. With its slogan of "Craft Your Own" you truly can get the exact pizza you desire. They have around 35 fresh toppings to decorate you roman style thin crust and a choice of red, white and bbq sauce. PizzaRev has hit the market of fast fresh personalized pizzas. We got one pizza from the menu and the other one we crafted with our own genius. The first pizza was Fennel & Sausage (olive oil, all-natural Italian cheese, ricotta, sweet fennel sausage, and fennel seeds). This one was chosen for it's oddity, if PizzaRev can make the oddest sounding pizza on their menu taste good then they should have no issue with more traditional pizzas, and they did not let us down. Choosing from one of the 8 preset pizzas is definitely the easiest option, just say which one you would like and walk to the end to await your freshly fire baked pizza. For those more adventurous souls you can chose to walk down the path of options, options and more options. Thus able to create either a master-pie or a monster-pie. Our second pizza was crafted, and of course a master-pie. First the thin crust pizza was lightly covered with a white ranch soon to be sprinkled with Italian and Feta cheese. The meat came on as grilled chicken and crispy bacon. Next came the large options of veggies and herbs: spinach, green peppers, onions, and garlic were all added to the master-pie. After all off the choices were chosen into the furnace it had to go. This gives you time to go choose from the drinks, one of those fancy touch screen flavor adding beverage machines. My cup was only halfway full by the time they called my name to pick up my pizza, so as far as quickness goes, they got my vote. The seating is a standard fast food seating and was in excellent condition. We sat down and thoroughly enjoyed our single serving pizzas. The pizzas were quickly made and in our possession. The crust was wonderfully crispy and the toppings warm and flavorful, especially because you can get exactly what you want. The nice thing being that you can always improve your recipe the next, and next, and next time you go. PizzaRev has an Oreo dessert pizza as well, however the texture was a little powdery and was sweet but not quite dessert sweet. However, it was plenty good enough for us to devour. 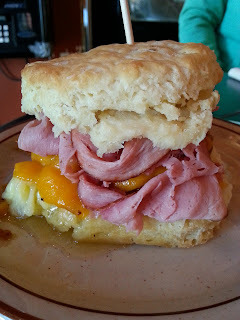 I will start off by stating that I will be back to give Toast 'N Jam a second chance. To be fair, rumor has it that the chef was out on the day I went in and tried to enjoy a nice breakfast with my family. I ordered the Strawberry Cheesecake pancakes. I've heard they are amazing! I love strawberries. 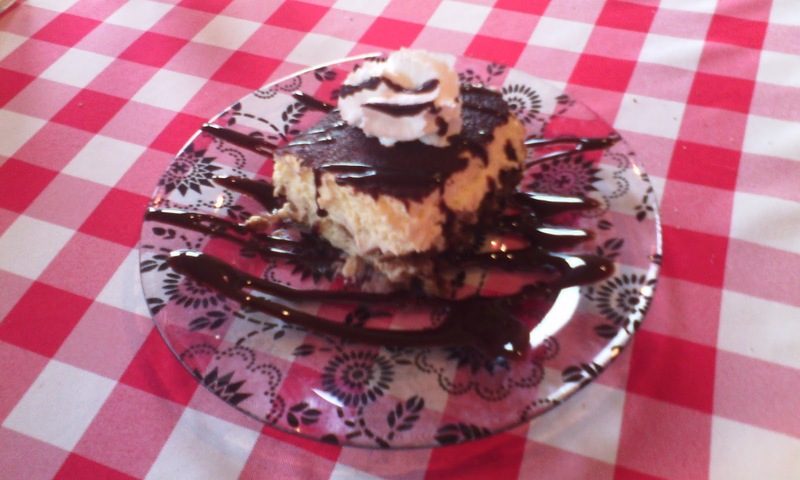 I love cheesecake and I expected this dish to be a good combination of both. What I got was some pancakes that were fine. The topping was the awful though. It was a foam that literally tasted like freezer burn with a hint of banana. The first flavor that hit my mouth was actually banana. I'm not picky! We were in the middle of moving and I was starving. I couldn't even get myself to eat these. I understand it's a little mean to post a review of a restaurant on their bad day. You know what though? It's also mean to open shop when you can't preform well. It's rude to expect your customers to pay full price for food that isn't what it should be. In my opinion, that isn't very good customer service. Shut down for the day or hire a substitute cook that can do a good job. Don't worry Toast 'N Jam. I will gladly give you a second chance and update my review. I have high hopes though and I hope and pray I will not be let down a second time. Beating the rush is an excellent endeavor, and generally well worth it! It's a grueling pain to wait in line as your stomach rumbles and you see countless others eating away. We were thus so privileged when we arrived at Pasta Jay's in Lone Tree. We arrived quarter after 5 to a "calm" Italian restaurant but left a bustling scene with a line of people waiting for food. The pizza is made with the traditional thin and crispy crust, an alfredo sauce, chicken, fresh baby spinach and black olives. I X'ed the black olives, because those do not taste good, and added some scrumptious roasted garlic. They readily accepted the change in menu and showed that they are flexible and an easy restaurant to eat at. The crust was a little too cooked on the outer edge, it being black, but surprisingly still tasted great. The pizza was good and I'm glad I got the lower price during happy hour. The Stuffed Ravioli was exceptionally amazing. With the ravioli smothered in Pasta Jay's famous marinara sauce, multiple types of cheese and the peppers being that perfect spice with out burning your mouth off, I endorse it. Worth going back at any time, even if those lines are long. For our dessert we ordered Tiramisu and cannoli. And for once my order was better then Beth's. I got the tiramisu which was good and light with a superb flavor. The chocolate dressing was at a slight variance to the flavor of the tiramisu but I just ate it without dip it in the excess dressing and was thoroughly "picked up". 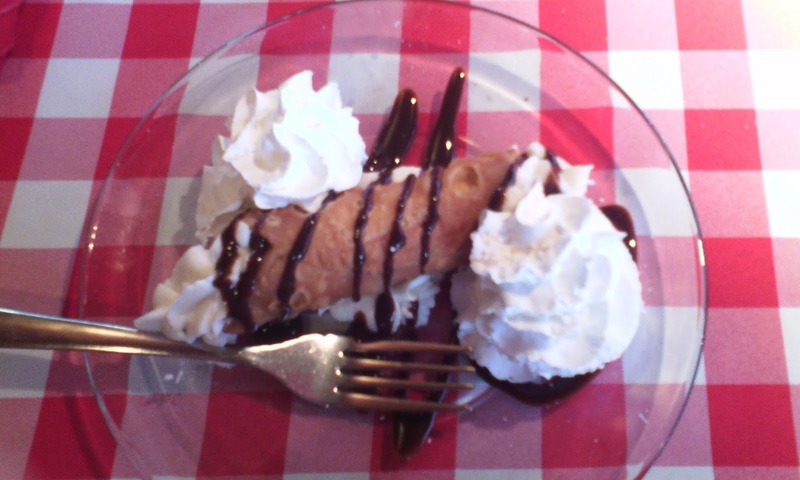 The cannoli, Beth's favorite, had an excellently deep fried crisp shell but the cream was a little too grainy due to the much added cinnamon. Jordan, our waiter, was exceptional, truly the best of the whole lot at Pasta Jay's in Lone Tree. She was truly honest! A great quality, one sometimes lacking in waiters. I had heard a few people mention Handsome Henry's. I didn't know it was a pizza place, nor did I know it was within a mile of where I was currently staying. Most importantly, I didn't know just how amazing Handsom Henry's would be or I would have been all over this place! A couple weeks into our stay, I finally made it to Handsome Henry's. We were seated at a squishy little center table. I hate center tables. They shouldn't even exist. Booths are so much easier and a lot more comfortable. Anyway, I wasn't pleased with our seats. Our waitress came out and got our drink order in a timely fashion. She quickly returned with drinks. My little girl's drink was in one of those cups you get to take home that came with a lid and the waitress made the coolest little design with the extra long curly straw. Simple details like that seriously win me over! We ordered and waited the perfect amount of time for our food. I ordered the Crab Rangoon pizza. My husband got the Sirloin Steak pizza. I usually write about my favorite item last but the Crab Rangoon pizza was SO amazing I have to write about it first. Imagine heaven in your mouth. There you have it. Crab Rangoon Pizza. Not good enough? Ok... Crab Rangoon pizza is a pizza made with "Garlic cream cheese, imitation crab, green onions, mozzarella, crispy wonton strips and sweet chili glaze". If you love crab wontons like I do, you will die. This is basically a giant pizza version of a crab wonton. The creamy sauce is outstanding. The subtle crab flavor adds a uniqueness but fun edge to pizza and the sweet chili glaze as a final touch makes this pizza thee very best pizza that I have ever eaten in my life. Now to be fair, it's hardly "pizza" but I don't care. This is my favorite food. Numero uno. Best food I've ever put in my mouth. That's how good it is. Just a warning, it's incredibly rich. I could only eat once piece before I had to steal my second and third slices from my family to make up for all the goodness of this creamy, sweet dish. I'm afraid this pizzas only downfall is that you really can't eat this as a meal. I'm afraid of the painful stomach ache that would follow. The Sirloin Steak Pizza was almost as delicious. The biggest difference here is that you can actually consume a few slices of this one without feeling sick. The Sirloin pizza is made with "Sliced tender sirloin steak, tomato sauce, chopped green peppers, sweet onions and diced tomato topped with provolone cheese". The steak pieces are good size and good quality. The sauce wasn't actually tomato sauce as they claim however. It's half tomato sauce half BBQ. I think that's not only a creative idea but I thought it was pretty great tasting too. My husband really isn't a fan of sweets though so he was off put by that and was pretty frustrated that the menu didn't state that. Don't let that deter you though. 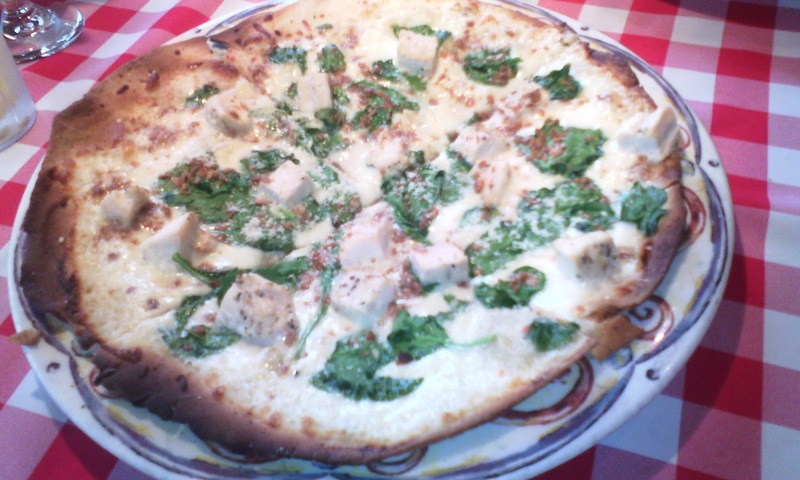 This is an excellent pizza! As I said, the meat is divine, the sweet onions are perfect the tomatoes add the perfect touch of acidity to the mix.